With no natural water reserves, the town gets serious about rationing and those who violate it. SANTA CRUZ, Calif. — Some overindulged their zucchini patch. Others didn’t bother with that dripping kitchen sink. 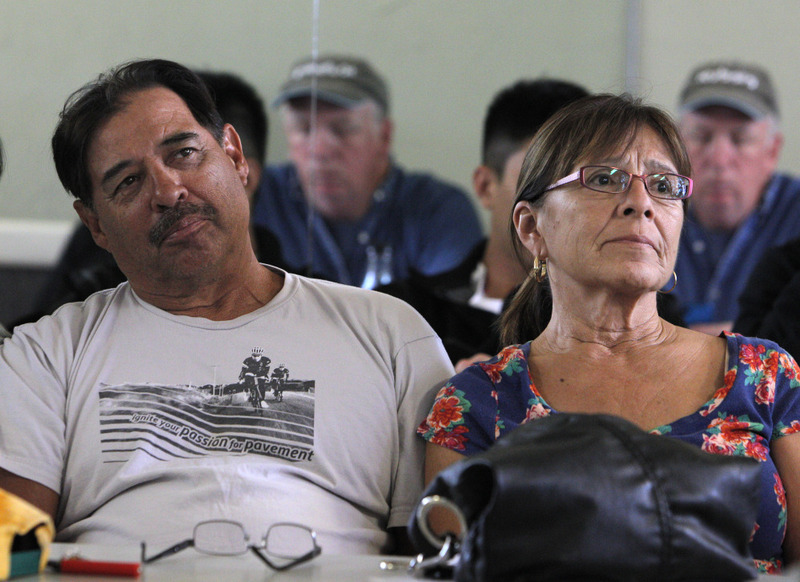 But now every Monday night in this drought-stricken beach town, dozens of residents who violated their strict rations take a seat at Water School, hoping to get hundreds of thousands of dollars in distressing penalties waived. Accused rationing scofflaws crowd a meeting room, hoping to get their fines waived. “We all know why you’re here. You all went over your allotment and got a big penalty,” he said. Two hours later, everyone was ready to ace their Water School quiz, identifying the community’s sparse water sources, listing ways to conserve water, describing how to use their water meters to check for leaks. “They’re turning this into something positive,” said Hughes, adding that she might take advantage of a $150 rip-out-your-lawn rebate she learned about. California is in the third year of the state’s worst drought in recent history. Farmland is going fallow. Lakes are turning to mud. Golf courses, cemeteries and parks are browning. 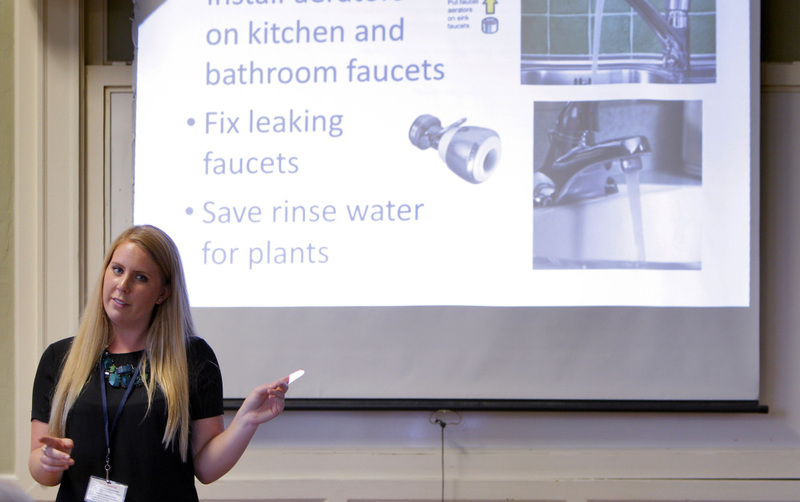 Earlier in the year, most communities took the “ask nicely,” approach, suggesting residents cut water use by 20 percent. But Santa Cruz, a coastal town 60 miles south of San Francisco, couldn’t afford to wait. Unlike most cities that have either groundwater, a connection to state canals or vast reservoirs, Santa Cruz is among those worst hit by the drought because what makes it special – the town is surrounded by ocean and mountains – also means it relies almost exclusively on storm runoff. The city cracked down in May, deploying “drought busters,” whom locals call “water cops,” to warn – and then penalize – anyone openly watering between 10 a.m. and 5 p.m., washing down pavement or refilling a spa. A logo, “Surf City Saves,” was launched, and a hotline to tattle on water wasters and mandatory household limits, allowing just 249 gallons per day for a family of four, were set. A typical dishwasher load is 20 gallons, a load of laundry can be 25 gallons, a toilet flush can be 3 gallons. Nationally, a family of four averages 400 gallons a day. So far $202,340 in fines have been suspended for Water School graduates. And there’s a waiting list for weeks to come. While Santa Cruz has cut back 25 percent of its water use, Gov. Jerry Brown’s request in January that everyone cut back 20 percent had the opposite effect statewide. Some districts actually used more, prompting a 1 percent increase in water use statewide. So starting in August, authorities are imposing statewide rationing with fines of up to $500 a day for residents who waste water on lawns, landscaping and washing cars. Water cops are being hired and fines imposed.